Autumnal glory in the Blue Ridge Mountains of North Georgia, USA. Ginnie Hart: Timeless is right, Peter, and I never tire of it! Thanks. A beautiful image, Ginnie!!! What a wonderful composition! Ginnie Hart: Thank you and thank you, Elizabeth! Ginnie Hart: That's exactly what I did, Jacquelyn. Trust me! Les couleurs d'automne sont magnifiques. Ginnie Hart: Yes they are, Martine, which is why it's my favorite time of the year. What a wonderful image Ginnie! I really like your composition. Fabulous reminder of a nice walk together. Things you find in the forest are sometimes so photogenic. Beautiful colours. Ginnie Hart: It was such a great walk for photos, MLMA. And to think the rest of the family never once went out to walk! Ginnie Hart: Thank you, Ray. THIS is why I love autumn so much! You have definitely caught the glory of the Autumn colours Ginnie, wheely good. Ginnie Hart: Awww, shucks, Chad. Thanks. This forest looks like a fairy- tale wood - wonderful! I assume that a giant who lives in those mountains owns this wheel. Ginnie Hart: Lots of gray-bearded giants, Philine. Thank you. I hope you're feeling well these days?! Oh good; I'm pleased to see that at a larger size. 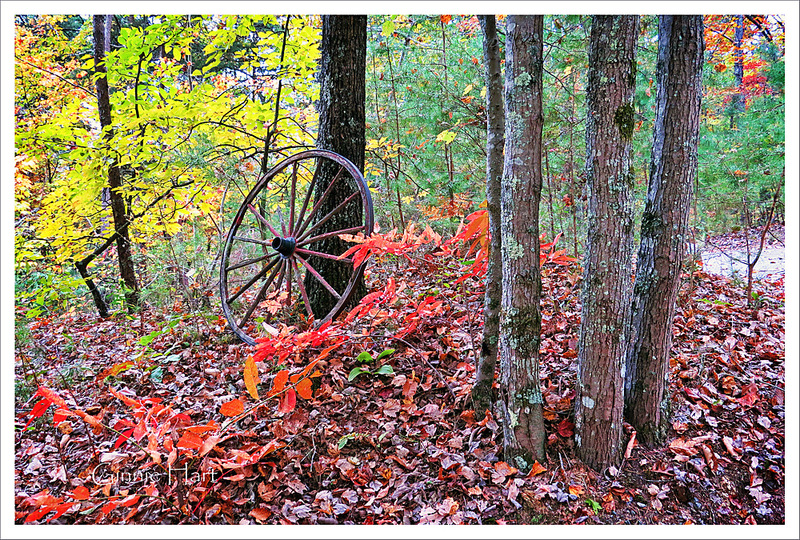 The old wheel makes this for me as does the red leaves and the golden leaves - ah.. so that's everything then Beautiful! Ginnie Hart: Oh, yes, Alan. Always nice to see it bigger. Thank you. I bet you felt you were in heaven on earth. Beautiful, Ginnie. Ginnie Hart: Absolutely, Mary...just like I do now here in the Netherlands with all the gorgeous colors. I LOVE autumn. Ginnie Hart: My guess is these are the only Blue Ridge Mountains, Brian, so yes, I'm sure. How fun. Mother Earth...oh how amazing she is! Beautiful!! Ginnie Hart: Yes, She is, Robin. Thank you. Ginnie Hart: Next year we're already scheduled for the weekend after, when it should be totally in peak! YAY. Ginnie Hart: HA! Well, at least you and Brian have given me quite the smile today, Martin. Thank you. It makes me wonder why the wheel is there... ? Ginnie Hart: One just never quite knows about these things, Larry, and can only surmise. I love the contrast of the spring greens with the autumn glows. Ginnie Hart: The Wheel of Time is a series of high fantasy novels written by American author James Oliver Rigney Jr., under the pen name Robert Jordan. The title immediatly came to mind when I saw this image, Cherry. Thank you. Ginnie Hart: They are what make this season so exquisite, Joshi. what a mix of reds, greens and yellows, Ginnie. and i like your find in the woods. Ginnie Hart: Thank you, Ayush. It's one of those scenes that brings a smile! Ginnie Hart: Thank you, Beth!